"I don't want to alarm you, but I think they're getting closer." When it's time to explore the world you want someone who's experienced in doing so. A well-worn traveler who doesn't hesitate to offer his or her services when appropriate to make travels easier. If that person is a robot then all the better. Atomic Robo: The Temple of Od #1 from IDW Publishing offers a robot who knows the world and history. The issue is written by Brian Clevinger, illustrated by Scott Wegener, colored by Anthony Clark and lettered by Jeff Powell. The year is 1938 and a viral weapon is being developed that will rival even Tesla's lightning weapon designs! Cue Atomic Robo, Jack Tarot, secret government agencies, moon men, magical arctic circle elves, jetlagged aliens, elderly rights activists, youngling laborers and the manifestation of human hope to help save the day! Atomic Robo is a character who feels like a robotic version of Hellboy, but Clevinger does a great job of giving him plenty of his own personality. Robo and the other characters find themselves in a pretty great conspiracy story that features all the continent-hopping of an Indiana Jones tale. Clevinger has a pretty grand adventure in mind for all the characters too that gives the reader a lot to keep up with. His dialogue is very entertaining and reads pretty breezily. There's enough of a foreboding sense throughout the issue that Clevinger uses effectively in letting the reader know that just because Atomic Robo is Atomic Robo, getting through tough situations won't necessarily be any easier. The illustrations by Wegener are very lighthearted and show his familiarity with the character. The early pages are full of action shots that Wegener captures very well, showcasing a frenetic chase through the desert. 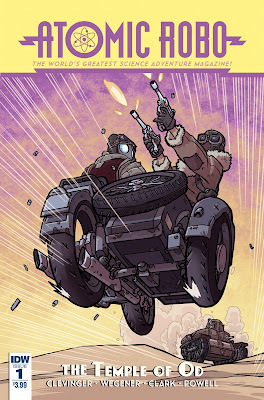 Atomic Robo looks younger somehow--maybe it's the fact that Wegener illustrates him in an exaggerated, rounded way. His styling is a direct contrast to that of the humans he interacts with, all of whom sport more of a caricature-like appearance. Clark colors the issue with a myriad of shades, all of which do a great job of showcasing the panel in a way relevant to the scene. Atomic Robo: The Temple of Od #1 has all the makings of a rip-roaring, globetrotting adventure. Robo is in the thick of things yet again and he's got to rely on his abilities and trusting others to get through it. Clevinger's script is strong and straightforward, offering humor to help lighten the drama. Wegener's illustrations are very clean and appropriate, providing a cartoonish-look that fits well within the Atomic Robo universe. Atomic Robo: The Temple of Od #1 is a pretty enjoyable read that doesn't take itself too seriously and hits the right notes. Atomic Robo: The Temple of Od #1 is in stores now.